In Turkmenistan, there is 100% GSM-coverage, with cellular communications available to everyone. 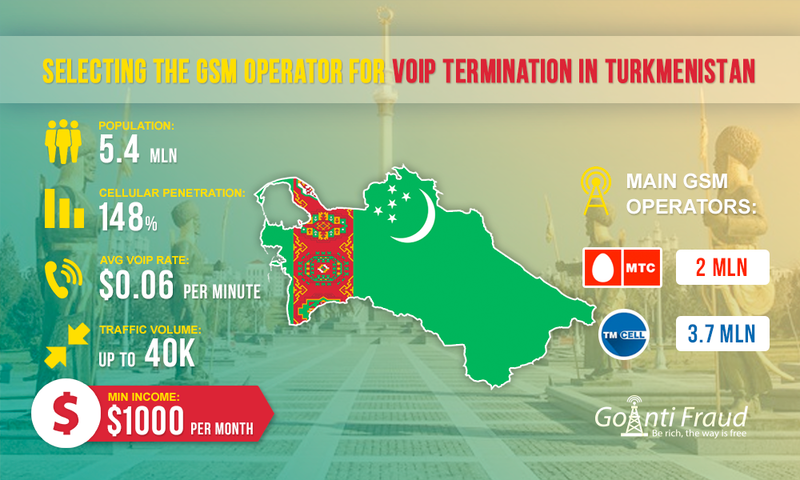 That is why GSM traffic termination in Turkmenistan is of particular interest for beginners. An important condition for making good money in this country is the right choice of the operator, whose SIM-cards you will use to terminate calls. The mobile market is shared between the two companies - "Altyn Asyr" (TM CELL) and “MTS-Turkmenistan” (BCTI). "Altyn Asyr" offers six prepaid packages, MTS-Turkmenistan” only four. "Altyn Asyr" is rightly called a national GSM-operator of Turkmenistan as it covers the largest database in the country - 3.7 million customers, while "MTS-Turkmenistan" has only 2 million subscribers. With regard to tariffs, TM CELL provides much lower than those of the Russian company "MTS-Turkmenistan". However, when choosing a mobile operator, you should in the first place consider earnings on termination, so not only the lowest rates, but also the possibility of permanent income from VoIP play the important role. From this perspective, it is important to choose the packages that involve lengthy conversations and antifraud that is not strict. Sowgat 2000 and Gürleşiber from TM CELL, as well as Smart (Smart M or Smart XL) from "MTS-Turkmenistan" are considered the best packages to land calls. With the average load on the termination, one minute of conversation via Sowgat 2000 will cost $0.0029. $0.00015 and $0.011 will cost a minute of conversation via Gürleşiber packages from TM CELL and Smart (Smart M and Smart XL) from MTS. When you connect to Sowgat 2000, "Altyn Asyr" provides 2,000 minutes for calls within the network, which is convenient for termination. If you use this package, one minute of communication will cost less than other plans. In addition, there is a little chance that antifraud will block your cards as the package is originally meant for intensive communication. No less popular with subscribers is the Gürleşiber package of the same operator. Though, it does not imply unlimited communication, as the previous one, a minute of conversation, taking into account the average load on the termination, will cost you from $0.0050 to $0.00015. At the same time, many terminators prefer packages from MTS. The most suitable of the five offered tariff plans are M Smart and Smart XL of the Smart line, with the price being $0.011 per minute. Moreover, as in many packages for smartphones, the operator offers unlimited minutes for communication. M Smart provides 1,000 minutes, Smart XL – 1,500, which is sufficient for the termination of calls. Originators are willing to buy termination services $0.06 per minute on average. The monthly income of an entrepreneur can amount to about $1,000 from one gateway channel. Seasoned terminators usually connect GoIP 32 channels, then this amount is multiplied by the number of ports.